A recent report from Mintel, a market research firm, says that “sales of dairy milk decreased 7% in 2015 and are projected to drop another 11% through 2020.” This marketplace shift is largely attributed to consumers scooping up non-dairy milks that are more readily available and often seen as healthier. Dairy milk is on the decline. So much so that the dairy industry has dumped millions of gallons of overproduced, unwanted milk. And a recent report from Mintel, a market research firm, says that “sales of dairy milk decreased 7% in 2015 and are projected to drop another 11% through 2020.” This marketplace shift is largely attributed to consumers scooping up non-dairy milks that are more readily available and often seen as healthier. Mintel’s data found that 49% of Americans drink non-dairy milk, and more consumers (69%) “agree that non-dairy milk is healthy for kids” than those who “agree dairy milk is healthy for kids” (62%). 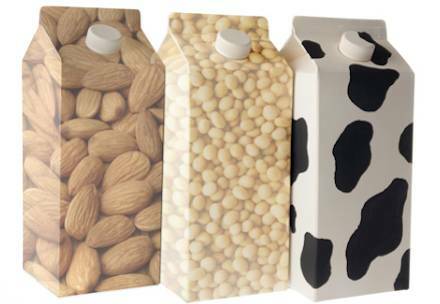 That variety is only getting wider: Consumers can choose from brand after brand of milks made from almond, soy, coconut, and more! The ice cream industry — also seeing melting sales — is getting a boost from dairy-free demand, and companies from Breyer’s to Ben & Jerry’s are milking the craze. Talenti also just released a new non-dairy sorbetto (peanut butter fudge!). So, don’t skim over this: The future is looking dairy-free! Even an international dairy lobby group has “dumped its support of dairy PRIDE” [Dairy Lobby Group Dumps Support for Dairy PRIDE Act].